PT Pelat Timah Nusantara Tbk – Latinusa (IDX:NIKL) is a reputable public-listed company in Indonesia, running business in tinplate manufacturing industry. Formed in 1982, Latinusa has strong reputation in Indonesia for more than 35 years in producing tinplate products; Coil, Sheet and Scroll. 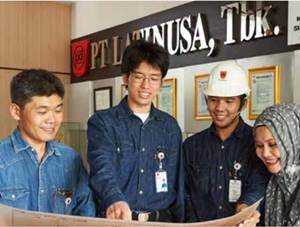 Based in Cilegon Banten, Latinusa now has installed total production capacity of 160,000 MT per year. PT Pelat Timah Nusantara Tbk is an affiliate company of PT Krakatau Steel (Persero) Tbk (Krakatau Steel Group), the largest state-owned steel producers in Indonesia. As of June 2017, Latinusa is 55% owned by Japanese Consortium. Japan Consortium comprise of Nippon Steel & Sumitomo Metal Corp (35%), Mitsui & Co Ltd (10%), Nippon Steel Sumikin Bussan (5%) and Metal One Corporation (5%). Another 45% are owned by Krakatau Steel Group (20%), PT ASABRI (21%) and general public (4%). According to information found in PT Pelat Timah Nusantara Tbk Annual Report 2016 as cited by JobsCDC.com, Latinusa recorded total net sales of US$131.66 million in the full year of 2016. This reflected a 4.14% decrease from US$137.36 million in 2015 from the same period last year. Total comprehensive income in 2016 amounted to US$2.53 million. This total comprehensive income reflected a 24.17% down from US$3.34 million in 2015. Minimum Bachelor Degree or equivalent (S1/D4) in Electrical Engineering, Electricity Power Engineering. Maximum age of 27 years old on 1 April 2019. Minimum Bachelor Degree or equivalent (S1/D4) in Metallurgy Engineering / Material Engineering / Chemical Engineering. Minimum Diploma Degree (D3) in Human Resource Management, Business Administration, Information System. Maximum age of 25 years old on 1 April 2019. Mastering Microsoft Office and SAP program. Minimum Diploma Degree (D3) in Electricity Engineering, Electrical Engineering.